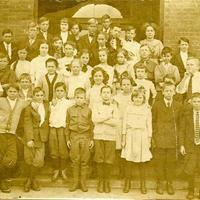 Nellie Furen's sixth grade class standing on the front steps of Sanford Grammar School during the 1911-1912 school year. Photographed from left to right is: front row - Ed Betts, J.D Woodruff, Ed Millen, G.W. Spencer, Ernest Brotherson, Ercel Little, Watson McAlexander, and PeeWee Tillis; second row - Roby Laing, Sherman Moore, Eva Hodges, Olga Vihlen, Maud Miot, Fannie Reba Munson, Virginia Brady, Carl McDonald, and John Morrison; third row: Percy Packard, Beatrice Hutchinson, Clara Bowen, Laura Parker, Ruth Waldron, Fern Ward, Alice Caldwell, and Harold Washburn; fourth row: Howard Wynn, Newton Stenstrom, and Annie Mae Morris; back row: Dennis Allen, Eunice Woodcock, Maud Allen, Guy Stenstrom, Argel Cameron, Rush Murphy, Walter Rowland, Nellie Furen, and Collier Brown. Originally located at 301 West Seventh Street in Sanford, Florida, Seminole Grammar School was first established as Sanford High School in 1902. The building was designed by W. G. Talley in the Romanesque revival style. Due to an increasing student population, a new school building was constructed on Sanford Avenue in 1911. The original building on Seventh Street served as Westside Grammar Elementary School, which was later renamed Sanford Grammar School. In 1984, the building was placed on the National Registry of Historic Places and converted into the Student Museum. The building reopened as the University of Central Florida's Public History Center in 2012. In 1927, a high school campus was designed by Elton J. Moughton in the Mediterranean revival style and constructed at 1700 French Avenue. The school reopened on January 10 and was renamed Seminole High School. In 1960, the high school moved to a new campus at 2701 Ridgewood Avenue and the former building on French Avenue was converted to Sanford Junior High School, which was later renamed Sanford Middle School. The old building was demolished in the summer of 1991 and replaced by a $5.77 million school complex. As of 2013, Seminole High School offers various Advanced Placement courses, the Academy for Health Careers, and the International Baccalaureate Programme for students. Original 5 x 7 inch black and white photograph: East Wing Hallway Display, Seminole County Public School Collection, UCF Public History Center, Sanford, Florida. Digital reproduction of original 5 x 7 inch black and white photograph. East Wing Hallway Display, Seminole County Public School Collection, UCF Public History Center, Sanford, Florida. 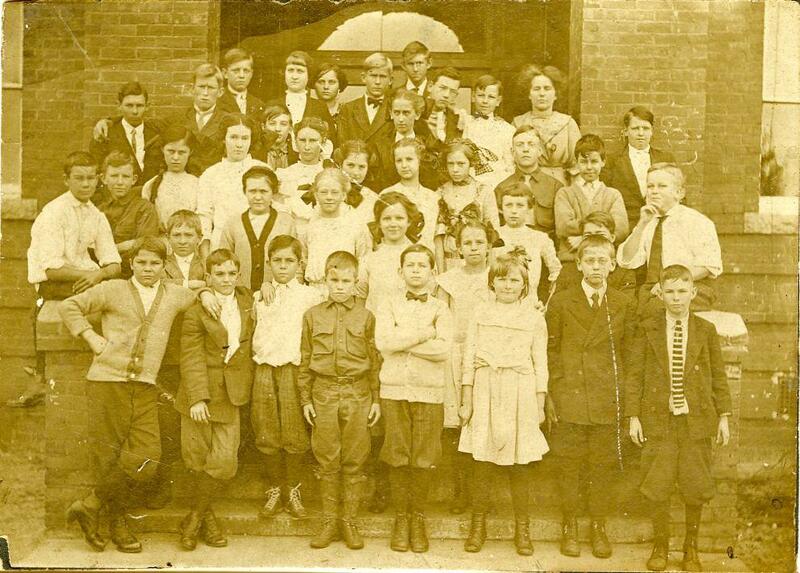 “Nellie Furen’s Sixth Grade Class at Sanford Grammar School, 1911-1912.” RICHES of Central Florida accessed April 22, 2019, https://richesmi.cah.ucf.edu/omeka/items/show/2835.